I spent at least an hour every day searching online for what could be causing this. 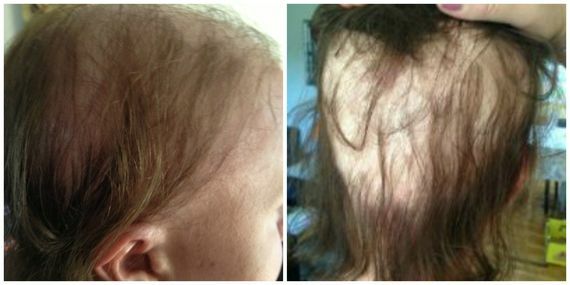 There were countless stories of women losing a lot of hair after having their babies, but nothing about losing it during pregnancy. Not even in Yahoo! Answers, for crap's sake. Chances are you're reading this because you saw the title and thought, "What the huh?" But if you found this through a Google search for "losing hair during pregnancy," "pregnancy baldness" or "major big time volumizing shampoo" because you're watching your part get wider every day, welcome! I am here to tell you you're not alone. 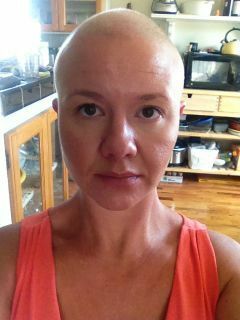 Ever since losing my hair during my pregnancy two years ago, I've thought of many things I wanted to write about: (1) the struggle to keep my appearance from dictating my worth as a person, (2) the guilt from feeling traumatized when there are many worse things women deal with during pregnancy and more challenging reasons people lose their hair, and (3) the pros and cons of the glamorous lady version of that infomercial bald spot spray. I realized, however, that what I really wanted to do was write the thing I so desperately wanted to find when I was losing my hair. I wanted to read about someone else going through it and emerging on the other side. Towards the end of my second trimester, I started experiencing an extremely itchy scalp. I would slather coconut oil and even hydrocortisone on it, but the itching was relentless. Just as that was subsiding, my hairstylist discovered a quarter-sized bald patch on the back of my head. I had already noticed that I had more hair in my comb than usual, and somehow seeing this patch made me feel better about it -- as if all that hair coming out was from this one spot and now it was done. I even showed it off at a friend's party the next day. But the hair just kept coming out. In my comb, in the shower, stuck between my bra strap and my back, on my pillow, and on pretty much every surface in our home. You can see the volume difference in my extremely chic messy bun from one week to the next. Within a couple of weeks, my hair was noticeably thinner. My hairline had receded about half an inch, my part was wider, and a hair elastic could be wrapped around my ponytail five times instead of two. I spent at least an hour every day searching online for what could be causing this. There were countless stories of women losing a lot of hair after having their babies, but nothing about losing it during pregnancy. Not even in Yahoo! Answers, for crap's sake. My doctor was also not a huge help. For a man who spent 10 minutes of my first appointment discussing how fast tuna can swim (quite fast, FYI), he was fairly taciturn. He mentioned that many women lose hair after delivery and that women's hair thins as they age, two true but largely unhelpful tidbits. So I asked what I felt was the most important question: Could this be caused by anything that could negatively affect my baby? He said no, which made me feel much better until I saw my reflection in the office window as I left. My hair continued to come out in fistfuls. I never left the house without wearing a hat or bandana, because you could see my bare scalp in several places on my head. Then one morning my mom called and urged me to get my thyroid checked. She and my grandmother had both experienced hypothyroidism (low thyroid levels), so she wondered if that might explain what was happening. Being over 35, I had had my thyroid checked as part of the buffet of tests at the beginning of my pregnancy, but after some mild pleading on my part, my doctor agreed to test it again. And yes indeedy, my thyroid levels were low. Not drastically low, but low enough to require medication and to possibly explain the hair loss. I started on a low dose of Levothyroxine and hoped that my hair would start growing back immediately. My doctor -- whose voice sounds like Hannibal Lecter's, by the way -- informed me of the cheery fact that my hair follicles had probably already shut down, and the cycle would have to be played out before regrowth could occur. He also said something glib about how most wacko things that happen during pregnancy are magically returned to normal after delivery. Then he mumbled something about Chianti and fava beans and left the room. 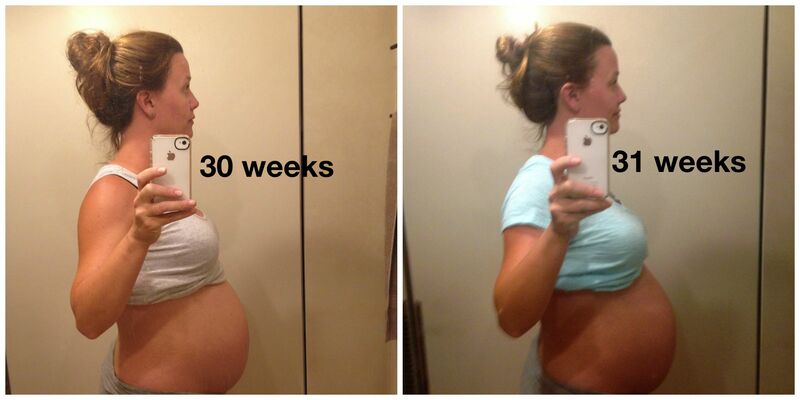 My hypothyroidism diagnosis came with about six weeks left until my due date. I spent a lot of that time crying. I cried every time I caught a glimpse of myself in the mirror, every time I saw a beautifully coiffed pregnant woman, and every time I saw a picture of myself with my old hair. I had waited so long to have a baby and had truly enjoyed the first six months of my pregnancy. Now a cloud was hanging over it. 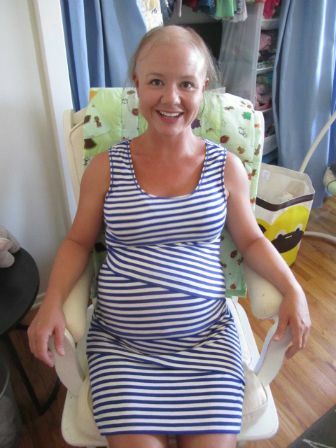 When I was a couple of days past my 40-week due date, we had a doctor's appointment. My doctor informed me that I was "not even close" to having this baby. I left devastated. I wanted to meet this baby girl who I assumed would be born with a full head of bouncy, highlighted hair in some weird circle of life thing, and I wanted this pregnancy to be over. I wanted to know if my hair was going to come back. We came home from the doctor. I did some more crying. And then I asked my husband to shave my head. I started by taking scissors to the remaining patches. It felt great. I'd never looked weirder. Then my husband took over with the trimmer and finished the job in under a minute. It was such a relief. There was no shock about my appearance; I'd had so little hair left that I already knew what I would look like bald. There were no more sad, stringy strands, and no more trying to make hair come out from under my hat in a way that made it look normal. I was unapologetically bald, and I loved it, despite my expression in this photo. Although it continued to feel like a relief to have shaved my head, the brief honeymoon period when I thought I'd be A-OK going out in public with an exposed scalp didn't even last until the next morning. It was back to the good ol' hats and the sudden realization that now people would assume I had cancer. A nine-months pregnant woman with cancer. It wasn't even true, and I felt sorry for me just based on the idea. Fortunately, the self-pity wouldn't last much longer. About a week later, my daughter Valerie was born. And within a few days, the first bursts of stubble appeared on my head. Dr. Lecter was right. More importantly, the instant my daughter was born I completely forgot that I was bald. The pictures below were taken around six weeks after delivery. 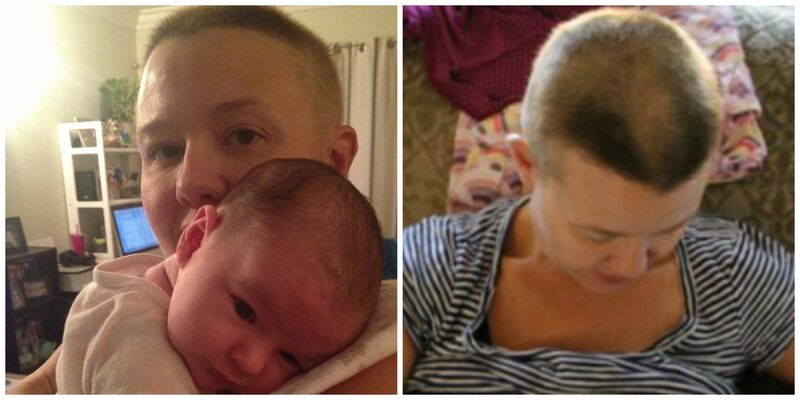 The photo on the right shows how my hair grew back thicker in that front V initially. Eventually, it all evened out. My hair continued to grow back, and within about three months it was passably normal. Today I have a full head of hair but slightly low thyroid levels, so I take Levothyroxine daily and get blood work every couple of months. I found a primary care doctor who is excellent and oversees my thyroid needs, but I also still see my same OB-GYN because I am too lazy to fill out paperwork with someone new. And because I like how he asks me if the lambs are still screaming while he does my Pap smear.